Can you believe that my husband doesn’t like cream cheese (or yogurt or sour cream but that’s an entirely different story). I happen to love the stuff. Especially when it’s made into a wonderfully creamy dessert. I’m not about to make a cheesecake for myself, though, since I know I would eat entirely too much of it. I indulge when I’m having company that enjoys it as much as I do or we are at friends’ houses who serve it. My sister, Janna, found this recipe several years ago and adapted it and is sharing it with us today. This layered pumpkin cheesecake is beautiful and easy and would be the perfect conclusion to your Christmas dinner. Not having a cheesecake pan isn’t a problem with this recipe – it uses a graham cracker crust in a pie pan. Purchase one ready made or check out this recipe to make it from scratch. Now I just need to invite a cheesecake lover over so I have an excuse to make one! Combine cream cheese, sugar, and vanilla. Beat until smooth, then blend in eggs one at a time. Remove 1 cup of the batter and spread into the prepared crust. Add pumpkin, cinnamon, cloves, and nutmeg to the remaining batter and stir gently until well blended. Carefully spread over batter in crust. Bake in preheated oven for 35-40 minutes, or until the center is almost set. Allow to cool, then refrigerate for 3 hours or overnight. This week continues all things Christmas at From this Kitchen Table. (Find all the posts here.) You can follow us on Facebook or subscribe by e-mail to be sure you don’t miss out! This entry was posted in Uncategorized on December 19, 2013 by Deanna Michaels. Thanks! I love cheesecake and pumpkin. Ooh yum – this looks tasty and pretty! I love pumpkin and cheesecake so this is a perfect combination! My 17 year old does not like cream cheese, but will eat it in cheesecake. I love cheesecake, pinning to my dessert board, followed you here from the Do Tell Tuesday Link Up. I wish my husband liked it in cheesecake! Thanks for pinning and stopping by! 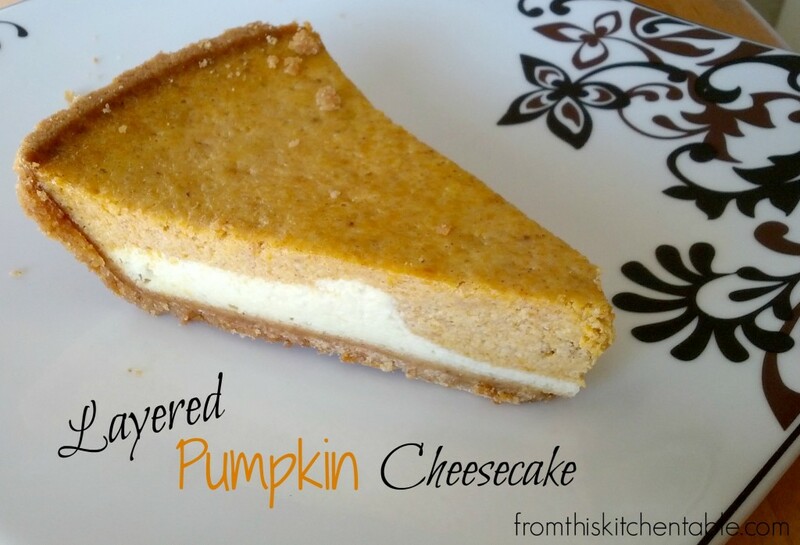 This looks great..I love pumpkin and cheesecake together! Me too! Such a yummy combination. Thanks for stopping by. Awesome. Thanks so much for featuring the cheesecake and for hosting. Have a great week. Looks delish! I love cheesecake and pumpkin pie. This Thanksgiving a friend make a pumpkin cheesecake that sadly wasn’t as good as it sounded. I’ll have to give this a try. Pinned. It is a great combination! If only I could get my husband to like cheesecake so I can make it more often. 🙂 I’m thinking there will just have to be mommy daughter dates or making and eating cheesecake in the feature. Thanks for pinning! Have a great day. I know! Hard to beat cream cheese and pumpkin. Thanks for stopping by and for hosting. …and thanks for linking up at our Weekend Wind-down party! I agree! Cream cheese and pumpkin are about perfect. 🙂 Thanks for stopping by! Hi there! Love this dessert! It looks great! Just wanted you to know that you’re being featured on the Weekend Wind-Down Link Party this week! Thanks for linking up to it and have a great day! Me too! Pumpkin and cream cheese is about perfect. Thanks for the feature and all your work on the Weekend Wind-Down Link Party. I appreciate it. I’m a sucker for anything pumpkin, any time of the year. This looks great! Me too! Pumpkin is so tasty. Good stuff.